Pokies have developed from a simple game of luck to a game with almost endless possibilities in terms of variety and game styles. While specific pay-line games are still largely common and thoroughly entertaining, modern titles such as Game of Thrones and Thunderstruck II have been built where players can play the entire position of each reel, rather than a fixed pay-line/pattern. These are known as multi-way games, or more specifically 243, 1024 way and 3125 way pokies and have proven to be one of the most popular formats of online pokies. 243-ways pokie machines have, as the name suggests, 243 ways of winning (3 positions on each reel, with five reels in total = 3 x 3 x 3 x 3 x 3 = 243). What makes this type of pokie so unique is players are able to cover all of the reels for a flat fee. We no longer are required to guess and choose which pay-lines to bet on. 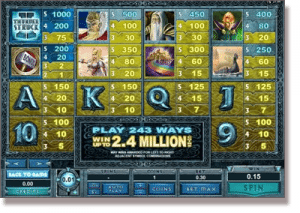 You can understand why 243-ways pokies is so popular; it is fun, easy to understand and play, and the possible winning combinations are substantial. What gives us the 243 possible winning combinations on these pokies is the fact most of these slots are typically run on five-reel machines, with three symbols on each reel. Such combinations still need to run from left to right, but symbols don’t need to line up in exact positions on the reel to trigger a win; in fact we have no restrictions on the placement of those symbols on each reel. In addition to the 243-ways pokies which run on five-reel machines with three symbols, you may also find machines with four or five symbols on each reel; this increases our winning possibilities to 1024 or 3125, respectively. Game developers can make as many symbols or reels as they like, as long as they stay true to the 3 or 5-reel formatting and make sure the game-play is relatively similar across the board, so players familiar with pokies are able to play without a fuss. With so many winning combinations in 243-ways pokies, there will almost always be a minimum bet we are required to place in order to cover all the possibilities, which may or may not be above what we intend to play per spin. The amount we need to cover all pay-lines will vary from game to game, but is usually somewhere in between 20 and 30 cents. Obviously, if we wish to spend more, we can play with higher multiples of the minimum amount in order to increase the amount of our potential winnings, betting up to the maximum stake allowed (again, varies from game to game). The hugely popular Game of Thrones pokies game can be played in two different formats – the standard 15 line game or the 243 ways game – with the latter standing to be the most lucrative with a top jackpot of 6,050,000 coins. 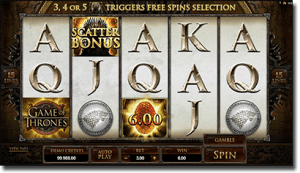 Based on the hit HBO television series and fantasy novel series by George R. R. Martin, the Game of Thrones pokies doesn’t actually feature any of the characters from the show, but is completely authentic in its themes and design. Along with the 243 ways format, GOT pokies offers stacked wilds, four different types of free spins and a gamble feature. A five-reel game based on Norse mythology. It features well known Norse gods and legends such as Thor, Loki, Odin and Valkyrie. It is a sequel to the wildly popular original Thunderstruck game, keeping the same addictive game-play but also adding new and enticing features. The wild symbol in this game is the Thunderstruck II logo, and will trigger a massive payout if you manage to get five of the symbols in a row. Thunderstruck II also has scatter symbols and free spin rounds. This game is now one of the most popular pokie games on the Internet. Perfect for those who love their pokies with a dash of vampire romance. Cashing in on the vampire craze, this game has music and characters which follow the genre, delivering an engaging experience to players as they gush over the brooding vampires, while hopefully winning money at the same time. 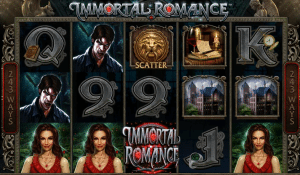 Immortal Romance features plenty of bonus features and we can score numerous free spin rounds which incorporate multipliers with lucrative payouts. The game also features a Wild Desire bonus, which can often result in additional winnings. This game has definitely earned its popularity. Despite being a slightly older film and video game franchise, Hitman tends to have its own cult following. Secret Agent 47 is the star of this game, a ruthless assassin with a human side. The game stays true to the theme of Hitman, featuring the characters you know and love as well as short movies and graphics that set the scene for an exciting pokies game. Symbols include characters as well as weapons. The Secret Agent 47 symbol is of course, the wild symbol and if hit on the third reel in a certain position, will spread vertically across the entire reel for a significant payout. We can also win bonus jackpots and unlock bonus games by hitting specific symbols. All these features as well as its great theme help to make Hitman one of the most played 243-ways pokies online. Try any or all of the above Microgaming 243-ways pokies at Royal Vegas Casino and receive up to $1200 upon registration.